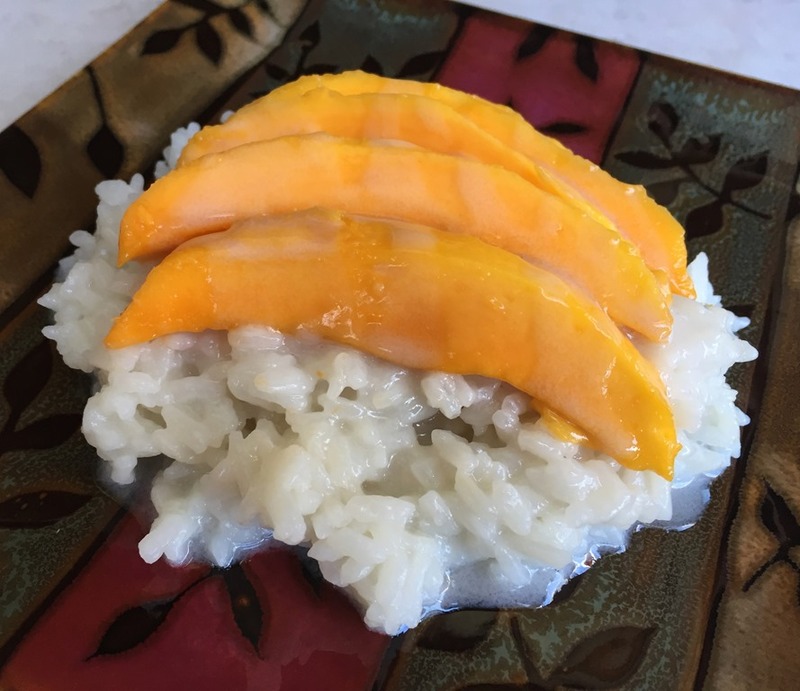 Mango Sticky Rice may be the primary reason my kids love eating at Thai restaurants. They also love the curries, stir-fries and satays, but this simple dessert definitely tops the list. Making this at home may not be as much fun as a night out for dinner, but it sure saves the pocketbook! And with this recipe, there is always lots to go around, so there is no fighting for the last bite. 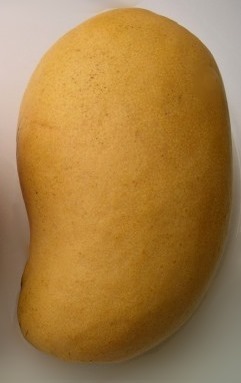 The two main types of mangoes you find here in the US are Haden and Ataulfo. 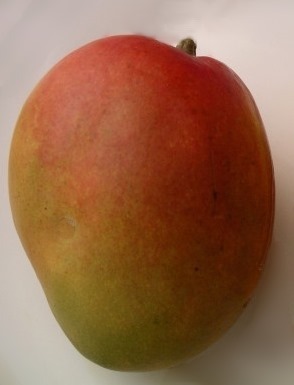 The orange/red/green Haden mangoes are the most common, but the smaller yellow Ataulfo mangoes are my favorite. They are very sweet and have fewer strings than the larger Hadens. Combine rice and 1 ½ cups refrigerated coconut milk or water in a medium saucepan. Bring to a low boil, then reduce heat to low and cover. Cook for 20 minutes, or until rice is cooked. Alternately, cook rice with coconut milk in a rice cooker. Carefully open the can of coconut milk and scoop out the thick coconut cream from the top of the can. Set cream aside in a small bowl. Pour the thinner coconut milk from the bottom of the can into a small saucepan. Stir in 4 Tbs sugar and ¾ tsp salt. Heat over medium-low heat until sugar dissolves, but do not boil. Remove from heat and slowly stir the hot sweetened coconut sauce into the rice in the pan. Cover and let sit for an additional 15 minutes, stirring occasionally. Place the thick coconut cream in a small saucepan. Stir in 2 Tbs sugar and ¼ tsp salt. Cook over low heat until cream melts and sugar dissolves. Do not boil. 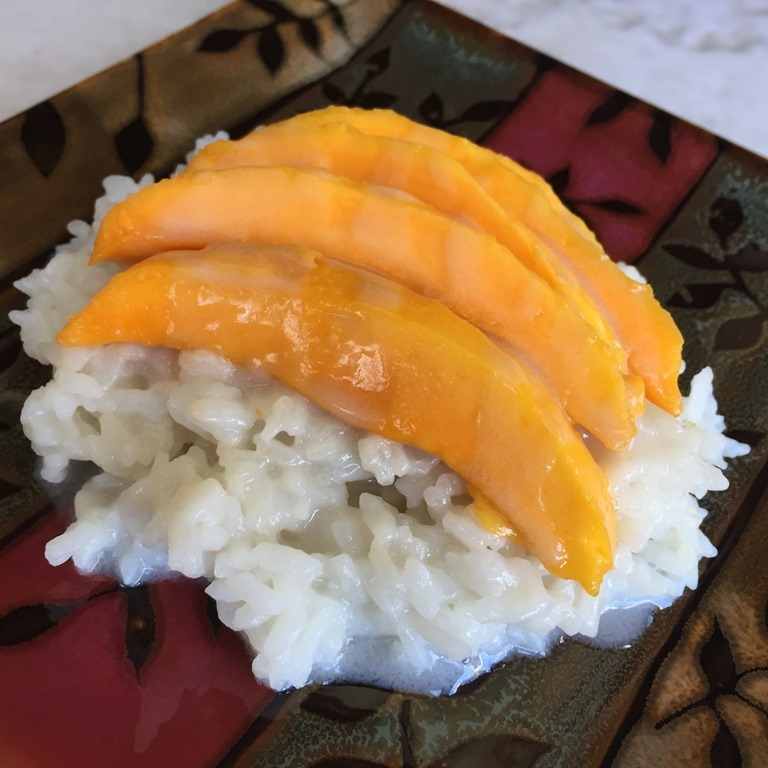 Place ½ cup of the warm cooked, sweetened rice onto each serving plate. Top with about ½ of a chilled, sliced mango. Drizzle with sweetened coconut cream. Serve immediately.